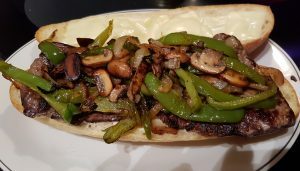 Posted on Apr 8, 2019 in Knotty Pine Original Recipes | Comments Off on Mushroom Pepper Steak Sub. Mushroom Pepper Steak Sub along with some crispy Duck Fat Fries! When the New York Strip steaks come in bulk at a super price, I like to vac seal and freeze. They are great to be first offerings on the bbq. The trusty cast iron skillet has a good collection of duck fat and the chunky fries will come out crispy crunchy. 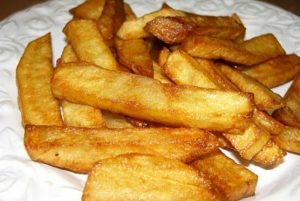 Another way to achieve the almost taste is to mix some duck fat with beef stock and spritz it on after frying in vegetable shortening. Slice up a few green bell peppers, a whole onion and 1/2 pound of mushrooms. I saute with butter and soya sauce. A nice fresh french baquette and lunch is served.